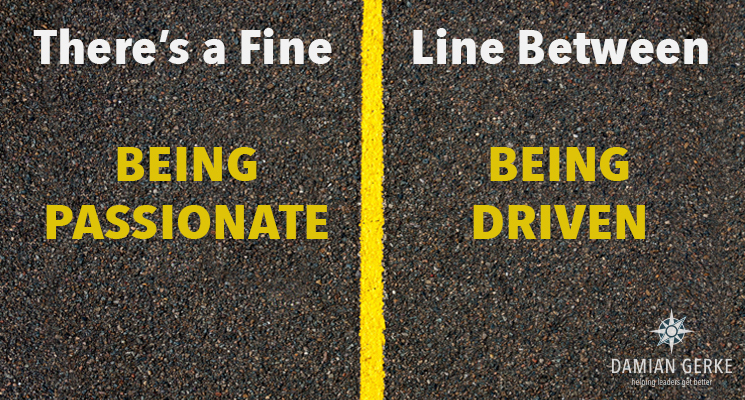 This is the next entry in the Fine Line Series, highlighting the often razor-thin margin between essential and detrimental leadership behaviors. Exhibit a particular behavior and you’re a champion; overdo it just a little bit and you’re a chump. How do you know where the line between them is, and how can you avoid crossing over it? It’s hard to lead effectively without (at some point) exhibiting passion. Passion communicates urgency and importance. It lights a fire and gets people moving. It motivates you and others to apply yourselves a little bit harder. But sometimes it’s easy for leaders to cross the line between being passionate and being driven. By “driven” (a common term that likely has a broad interpretation) I mean an unhealthy level of compulsion to achieve. It can look overzealous, preoccupied, extreme and even fanatical to others. Being driven can quickly discredit you in the eyes of your team. Your followers won’t understand you, where you’re coming from or where you’re going. And, most importantly, they won’t understand why. Your followers won’t understand you, where you’re coming from or where you’re going. And, most importantly, they won’t understand why. The source of passion is the cause you’re working toward; the source for drivenness, in contrast, is you. When it becomes more about you, it becomes weird to everyone else. When it becomes more about you, it becomes weird to everyone else. Why should it be important to my team? When the “why” of what you’re doing is outside your own self-interests then it becomes more tangible—and more important—to everyone. If it’s not important to them, they won’t be motivated. And they will not sacrifice and devote themselves toward outcomes that primarily serve your self-interests. Managing this requires some self-awareness. What does passion look like on you? What should it look like? What could it look like? What does being driven look like? It also requires some communication savviness. How do you talk about the “why” of what needs to get done? Do you talk about it at all? What clues can you listen for to know the work is important to them? Most jobs include some work effort that’s not inherently motivating—it just needs to get done. But the more you can make the work important to others, the more passionate they will be about it. Your passion becomes theirs. The more you can make the work important to others, the more passionate they will be about it. How will you capture and measure your level of passion? What will you do to communicate your passion to others? Damian Gerke on “Be a Leader, Not a Manager!” … Really? Milagro on “Be a Leader, Not a Manager!” … Really? Hannah G on “Be a Leader, Not a Manager!” … Really? Thanks! Please look for a confirmation email from us to complete the subscription.